In a clearing at the confluence of Yellowhammer Gap Trail and Nichols Cove Trail is a small cemetery. “Two Sisters of John & Marget Dotson – Born December 14, 1914 – Died December 20, 1914 – At Rest”. In front of the grave marker are two small granite markers with no names. It is a beautiful area, with new growth trees and green foliage. Small rocks are piled near the cemetery, once walls, but now fallen and covered with moss and ferns. The Nichols Cove Trail starts at the northern edge of Slickrock Creek Trail and follows what appears to be a former wagon road or rail line used by loggers. It crosses the Nichols Cove Branch multiple times, and true to its form as a wilderness trail is covered with hemlock blow downs, mountain dog hobble and slick rocks. Just when you are at your wit’s end you come to a small crest, then a clearing once farmed by the Dotson family. This now forested area was once full of crops growing on the mountainside and according to Marshall McClung, a former employee of the U.S. Forest Service and local Graham County historian; the Dotson’s lived in a small cabin in the area during their seasonal work. I thought a lot about the two small children, buried six days after they were born. How their parents must have been so upset, to lose twin daughters on one day. This weekend was a wonderful backpacking trip with Sarah, Eric and I. We parked at Big Fat Gap, hiked to Slickrock Creek Trail camped on the creek side and hiked out the nest day via Nichols Creek. Joyce Kilmer is astounding. It’s beautiful. But more so, the history of the area is fascinating. Total mileage is 8.5 miles. Marshall McClung, Mountain People – Mountain Places (Robbinsville: Graham County Historical Society, 2006), 153. Tim Homan, Hiking Trails of the Joyce Kilmer-Slickrock & Citico Creek Wilderness (Atlanta: Peachtree Publishers, 2008), 78. I love walking through ancient cemeteries! Your pictures are always beautiful. Love the red eft and millipede! It always gives this depth to the woods, making me wonder who walked there before. Thank you for your compliment, i very much appreciate it. I was reading that the red eft is actually the juvenile stage of an Eastern Newt. It transforms from orange to a larger greenish-brownish skin. amazing! Fabulous photos! 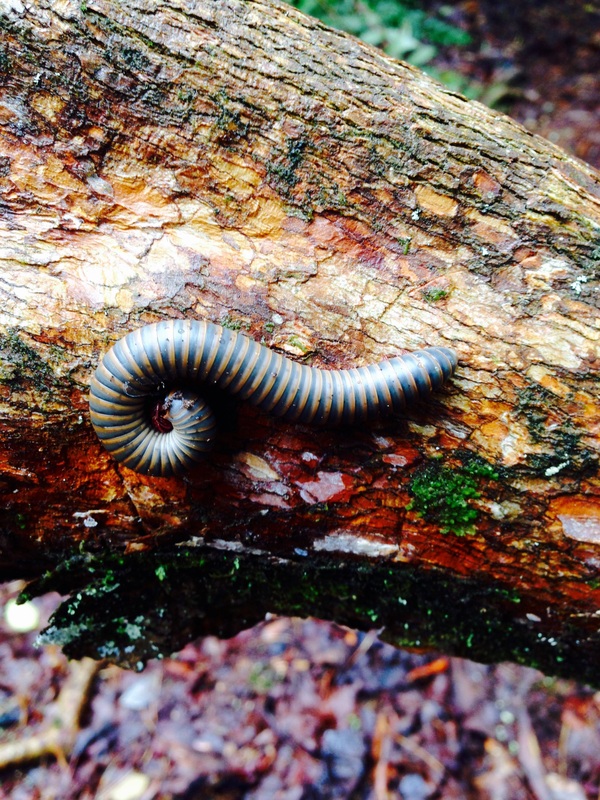 What size is this millipede? They don’t exist in this form around here. I appreciate the compliment very much. Do you know any more about the Dotson family? Why did both babies die at six days? I tried my best to find out more. I talked to the staff at the Nantahala Ranger District office and they put me in touch with Marshall McClung. I asked him if he knew what happen to the Dotson girls and he replied that: “I am not sure of the cause of their death. Many children died very young in those days from multiple causes. Prenatal care as we know it did not exist then.” I couldn’t find anything at the local libraries written on them either. So sad that a family lost two girls in one day.